In today’s competitive tech job market, employers are looking beyond technical skills when recruiting new talent. As technology, data, and artificial intelligence (AI) fields continue to grow in Ontario, hiring highly qualified professionals to meet the demands of the job market is a challenge. Aside from the technical skills required to perform these specialized job functions, senior leaders and hiring managers are struggling to find people with the human skills needed to excel on the job. Executives at industry-leading tech companies note that cross-functional skills — the broader intelligences that allow an employee to work effectively across teams — often take a back seat on applicants’ resumes. While it might be tempting to cram your resume full of technical skills to get the best new jobs in data science, web development, digital marketing or cyber security, most employers are actually taking a much more human approach to their hiring practices. Top companies want team members who are logical problem-solvers, analytical and clear communicators, and experts who are just as comfortable writing a business case or presenting their findings in a boardroom as they are performing technical functions. These cross-functional skills are moving applicants to the top of the pile. “Students upgrading their cross-functional skills will be a critical paradigm shift for Information and Communication Technology companies like mine,” says Christian Gravel, CEO of Intellect Dynamics. As a thought leader in the rapidly growing field of AI, Gravel is lending his expertise to the launch of Canada’s first Certificate in Machine Learning program as an Advisory Council Member at York University’s School of Continuing Studies. 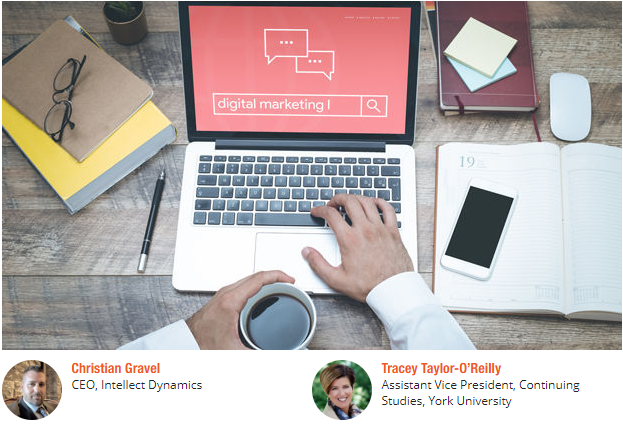 In order to fill this critical skills gap, York University has created a rapidly-evolving suite of continuing education programs designed to help students reach their career goals faster through flexible, accelerated learning. Current programs include part-time certificates in machine learning, full-stack web development, digital marketing, and cyber security.